A few weeks ago, as I was watching a documentary about origami (Between the Folds by Vanessa Gould) I found myself thinking about Clean Language, what it means to me, my experiences with it and how I have formed a way of looking at, learning and teaching it to others. I realized I think of it as the art of Clean Language. Although I know that Clean Language is based in a certain logic - the logic of the client, their desired outcome and the probability that a particular question will elicit a useful answer - to me it is still an art. When I heard Eric Joisel speak of the extraordinary nature and magic of origami, I recognized his sentiments. Six years ago I discovered Clean and began to let go of all the methods I had studied before... dreams, Jungian symbolism, sand-tray, hypnosis, graphology, esoteric arts, the world’s religions... I have been captured by Clean Language the same way Eric Joisel was captured by origami. "I wished to fold the laws of nature, the dignity of life, and the expression of affection into my work." David Grove and Sensei Yoshizawa were innovators ahead of their time, taking what came before and changing it ever so slightly to respect the medium more fully - whether that medium is a single sheet of paper of the single system of a human psyche. Among the champions of David Grove were Penny Tompkins and James Lawley. Penny and James first met David Grove in the early 1990’s. Little did they know at their first meeting that they would go on to dedicate the next five years of their lives to the study of David and his work. From this exceedingly rich joint effort they developed a teachable model called Symbolic Modeling which incorporated David Grove’s Clean Language. 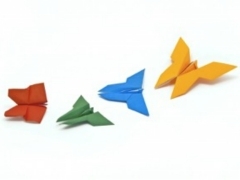 Each year over 200 academics meet to discuss origami. They are folders of a different kind. They are on the forefront of science, research, product development and more. They discuss ways in which the art and science of folding can be applied across many disciplines. Others meet around the world at different events to simply share in the art of origami - beginners and experts alike. Addiction Counseling is subtractive - the deletion of the substance of abuse is the first step to health. But Clean Language, like origami, is metamorphic. Where origami uses the sole medium of the paper, in Clean Language we use the exact words of the client. We are not adding in suggestions, trying to tell them a different story or trying to take away someone’s pain, suffering or concerns. "The repeated use of "and," and "as" connects each question, and the response to the question, to the client's preceding experience." One question – what can you do with one question? James Lawley tells a story where the use of one question brought about significant change for a training participant. The participants working in pairs and as James watched, the facilitator continued to ask, “And is there anything else?” until the client had quite a significant change happen. When asked about his reason for repeating this question, the budding new facilitator said that he could not remember any of the other questions. And there is logic in the questions we ask as Clean Language facilitators - commensurate with the inherent logic within a client’s system. Using Clean Language with a client is like unfolding their metaphors and their relationships, one metaphor to another. David Grove said clients came to him with an “undifferentiated mass of information”. Perhaps information is being opened and unfolded from the recesses of our brains, which is also full of folds? Origami is an art form that could allow everyone to make their interpretation of the world in paper. Clean Language and Symbolic Modeling could allow everyone to make their interpretation of the world in metaphor... not just in the natural process of comparing or contrasting one thing to something else, but in a recognized restructuring of our folds, of our mind, our memory, our desires. There is something elegant and simple in Clean Language that is like a great piece of art - without extraneous lines or medium - there to facilitate desired change(s) expressed by another human being. By learning this language - one can follow the ebb and flow of that human system, more simply, more expressively. Can you think of any other ways Clean is like origami? We'd love to know what you think! Sharon has a B.S. in Psychology with an emphasis in Jungian symbolism. She was the first Certified Clean Facilitator in North America, and runs trainings in the USA. She is also a recognised Clean Assessor.